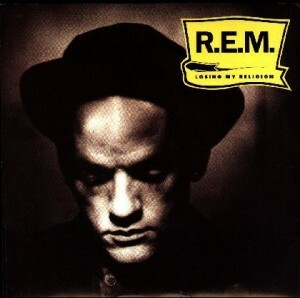 You are here: Home / Creative / my music / demos / 30 for 30 Project, 1991: “Losing My Religion” – R.E.M. You can read a lot of different meanings into “Losing My Religion,” but to me it has always been a song about the status quo, and how some people are better at changing than others. I’ve never been good at change. Not in the short term, anyway. In 1991 I had the opportunity to leave my small, private, religious school to attend a magnet-school program at Masterman, which was (and is still) the best public school in the state. I wanted to stay. Why attend a magnet school with other smart kids? The MG program I used to go to was lame. Wouldn’t this simply be all lame, all day? Yet, clearly I needed to leave – my grades were dipping as I grew increasingly bored with my classes. In 1991 my interest in music waned. I was much more interested in reading. This might have been because records began to be phased out in favor of CDs. I remember the last vinyl LP we bought was Madonna’s Like a Prayer in 1989. We didn’t have a CD player in our house until 1994. I didn’t want one; I didn’t want to have to buy my cassettes all over again. Yet, clearly I fell behind – when I look at the hot singles and albums from the intervening four years, much of it is unknown to me. I’ve never liked losing my religion, but eventually I learn how to move on. You make it look so easy. Love your voice on this cover.